Back in July, the GSM Association’s research arm Wireless Intelligence recorded only a measly 27 million LTE subscribers worldwide, most of them concentrated in the U.S., Japan and Korea. Well, a lot happened in nine months. 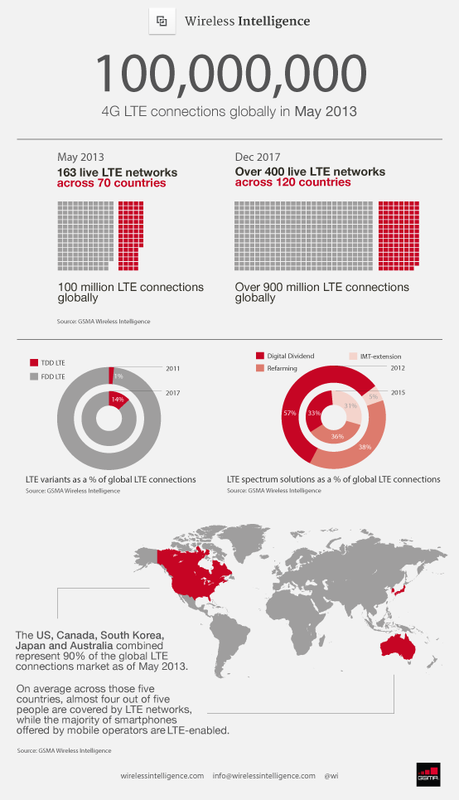 Wireless Intelligence found that global LTE connections grew four times that number to 100 million in that timeframe. Most of those connections are still in the U.S., Korea and Japan, but Australia joins the list of early LTE adopters. Those four countries account for 90 percent of LTE connections, and within their borders four out of five people are in LTE coverage area, WI found. Today there are 160 LTE networks in 70 countries, but WI predicts that in 2017 that number will grow to 400 networks in 120 countries hosting a total of 900 million subscribers.